Today, most people consider Gaithersburg, Maryland to be an outer-ring suburb of Washington, D.C. However, the city is much more than an extension of our nation’s capital: it’s one of the top five most populated cities in Maryland, and its history as a town dates back almost 150 years. Gaithersburg’s downtown district is full of historical landmarks, and its residential neighborhoods feature homes built in many of the housing booms that have come and gone throughout the years. As a result, it can be hard to determine what you’re getting when you move into a home in Gaithersburg, at least if you don’t do your research first. While many houses are new or recently repaired and refurbished, others are decades old and decades overdue for a basic inspection and updated materials like non-asbestos insulation and paint without lead in it. Some homes also have hidden problems like water leaks and mold. When that’s the case, it’s time for a mold remediation in Gaithersburg. “Mold” is more than just a single species. It’s an entire category of fungus, with thousands of known species and even more getting discovered all the time. Unlike bacteria, mold is multicellular, but each mold organism is still too small to see with the naked eye. It’s only once millions of them grow in a single spot that we can see them as fuzzy blobs. Different species use different food sources. Some varieties grow on apples, bread, and other human foods, and they’re responsible for the sour, bitter taste that lets you know your food has gone bad. Others survive on organic materials like cardboard and wood, or on the skin flakes and hair that turn into dust. All these mold varieties release billions of spores, which are so light that they end up just about everywhere. There’s no getting away from them, but on the bright side the usual small spore count doesn’t cause much trouble. There is one other thing that every mold variety has in common, though: they all flourish in the presence of water. When mold has food and water, and when it doesn’t get wiped away by someone cleaning the area, mold can survive on just about any rough surface, not just cardboard and wood. It also releases an acid as it eats, and this acid can weaken the material it’s living on, including concrete. Another way mold can become an issue is when black mold starts growing in large quantities. 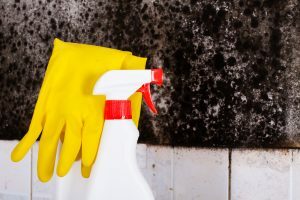 “Black mold” refers to certain varieties that have a dark color and release spores containing a mycotoxin. In large enough quantities, this toxin can affect humans with fatigue, sneezing and coughing, headaches, and other cold-like symptoms. If you’re looking at an old home in Maryland, you’ll want to see if there are any deep mold infestations. And if there are, you should arrange for a mold remediation in Gaithersburg, Rockville, or wherever the home is located. Step 1: We find out where the water or moisture is coming from and fix the problem. Mold can’t grow without water, and so removing this source is always an important first step. Step 2: We quarantine the affected location. The cleaning process releases a lot of spores, so it’s important to keep them contained. If we didn’t, the spores could spread to the rest of the building and make the air quality worse instead of better. Step 3: We clean the mold. For a mold remediation in Gaithersburg we use industrial-strength chemicals and all our three decades experience to clean each house as thoroughly as possible. Many articles like rugs and carpets can still be used after the cleaning process ends, but sometimes we have to remove and destroy parts of the house, including wooden beams, insulation, and even concrete blocks. Step 4: We make the house as good as new. Whatever we remove, we repair and replace. If you know you have a mold problem, or even if you just suspect it, and if you live in or near the state of Maryland, contact AA Action Waterproofing today. We offer free estimates on mold remediation in Gaithersburg, Bethesda, Rockville, and throughout the state, and we have an A+ rating with the Better Business Bureau. No matter how bad your problem looks, we can solve it.